Customers of ID Mobile's MogoRoad iPhone application are complaining that they're getting sales calls from the company, a process which turns out to be technically a piece of cake. 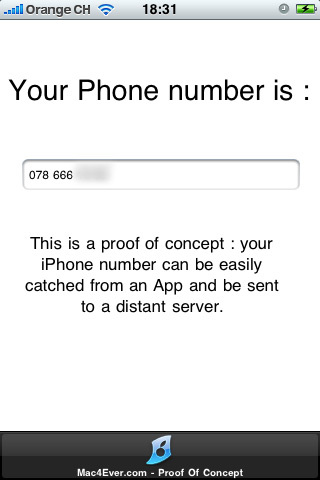 The proof of concept was put together by Mac4Ever who created an iPhone app which displays the handset's phone number. Passing that back to a server is obviously trivial, and could easily trigger the kind of sales calls about which downloaders of MogoRoad are complaining. Users commenting on the Swiss iTunes store are upset that their personal data has been uploaded*, and is being used to try and sell them stuff. Programmatically reading a mobile phone number is generally quite hard, because mobile phones have no real reason to know their own number. SIMs store an IMSI (International Mobile Subscriber Number) which is unique to every user, and can usefully be utilised for basic copy protection, but the mapping between that and the mobile phone number is done by the operator - the mobile phone responds to connections routed to the IMSI, so it has no reason to know its own number. But there are uses for such a thing, and it seems the later versions of the iPhone SDK include a call to retrieve the number, with all the privacy concerns that implies. Apple works hard to ensure that the customer's relationship is with Apple, and no one else, so it's hard to imagine that behaviour like this isn't going attract attention from Cupertino. * ID Mobile has now been in touch, and tells us that numbers are harvested by sending an SMS and snagging the sender's number on receipt, rather than the clever tricks demonstrated by Mac4Ever, but the threat, and the customer irritation, both remain. Battery has a weird shape, power is down but hey, it has a hidden Notch!